1. The Heli-Kit News Discussion Group / Forum is now advertisement-free (no more of those pesky pop-ups), and is searchable. 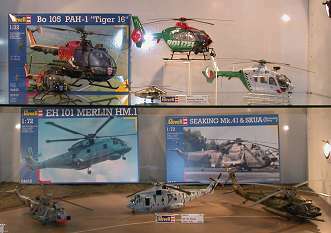 The Revell display at Nьrnberger Spielwarenmesse shows the boxes for the Merlin and the Sea King, and models of these plus the recent 1:32 Bo-105, 1:32 Police EC135, 1:48 Pave Hawk and 1:144 camo CH-53G. Merlin fans will note at least one slightly worrying problem - the continuing absence of the forward cabin window on the port side. It is to be hoped that the display model has been made up using the fuselage of the existing Italeri version rather than the (hopefully) updated kit as it will eventually be released. 3. 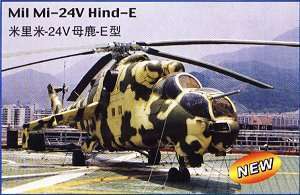 AFV Club of Taiwan are planning to release (in February) a 1:35 S-70C 'Rescue Helicopter' #35S13. It is possible that this may be a re-boxing of one of the Academy/MRC Blackhawk kits. From the small picture available it appears to be the RoCAF 4th Tac Fighter Wing Rescue Squadron S-70C-1A 'Bluehawk' which is a Blackhawk type, and unfortunately not one of the RoCN S-70C(M)1 Thunderhawks (SH-60B Seahawk types). 4. 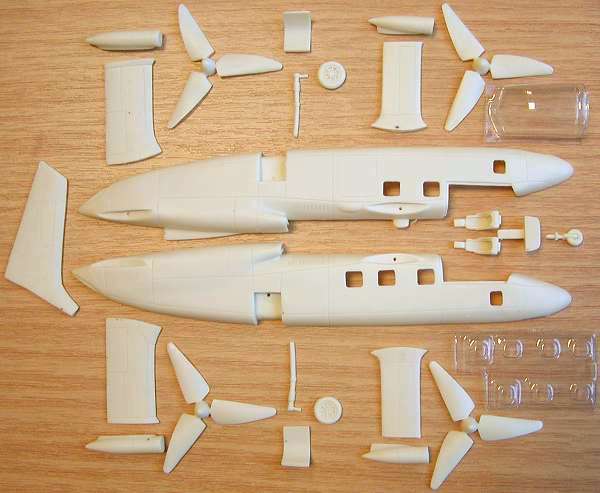 Anigrand Craftswork have released their 1:72 resin Curtiss Wright X-19 V/STOL. This is well up to the standard shown in their first release, the Bell X-22, and comprises 25 resin parts requiring minimal clean-up, plus vac-formed cockpit canopy & cabin windows. Order direct from Anigrand. Two X-19's were built but only one was flown before the project was cancelled. The first X-19 was destroyed in an accident on August 25, 1965, at which point the project was cancelled. 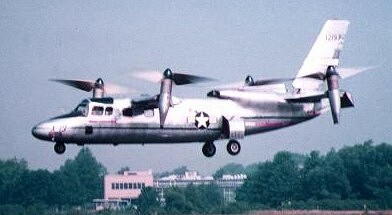 The second X-19 is assumed to have been dismantled. Information from X-Planes. 5. 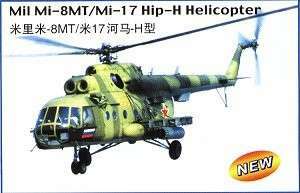 Trumpeter's 2003/04 catalogue includes the 1:35 Mi-8/17 and Mi-24V held over from 2002. No other new helicopters are listed. 6. Academy showed their proposed 1:35 MH-60L DAP variant at the recent model show in Korea, for release some time later this year. 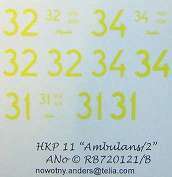 RB720121/B is a sheet of additional markings for three HKP 11 (AB412HP) 'Ambulans' helicopters not covered by sheet #720121 (HKN #140). These are 11331 'Anna', 11332 'Claudia', and 11334 'Sophia'. Also available in 1:48. RB720127 is SE-HLZ, as above. The 'Ymir' was operating in the Arctic, not the Antarctic as I said previously. (No-one wrote to me to point out that Polar Bears in the Antarctic were fairly unlikely!). 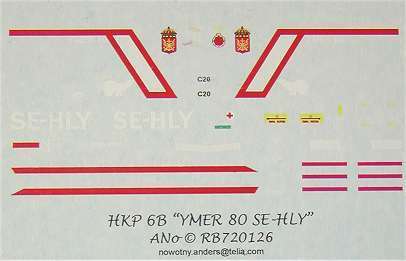 The two HKP 6B carried slightly different markings including different squadron crests, hence the separate sheets. The detail in all these decals is very fine, and the sharpness excellent (very much better than shown in these photos), and the instruction sheets include a lot of interesting background information, colour notes, references, etc. 8. The Cobra Company 1:35 AH-1W NTS Upgrade (HKN #159) has now been released. SH-60B: 5 general pictures; 16 internal; 46 external; 12 engines; 5 main rotor; 18 tail, tail rotor & rotor-fold; 5 armament; 10 'nose-art' (none of it on the nose!). HH-60H: 29 photos, as above. This is an excellent publication; it can be considered an essential reference for anyone thinking about building models of any of these Seahawk variants. Thoroughly recommended, let's hope there will be many more in this series. UH-1D 16642 'Nevada Gambler', 227th Aviation Battalion, 1st Cav., Phuoc Vinh, 1969. This is shown with detail of orange coloured flare magazines constructed in the field from oil drums, and used for battlefield illumination. OH-6A 16135, 101st Air Assault Division, with M-134 minigun. AH-1G 031 'Pandora's Box', 2/20 ARA 'Blue Max', 1972, as driven by CW2 Wayne Richardson. The Squirrel kits should now be released in May or June this year, and the S-76 around September. They are being moulded by a new Model Alliance partner in Australian who does both injection moulded and resin conversion sets and kits. The Agusta A109A/C will be available at the end of the year. 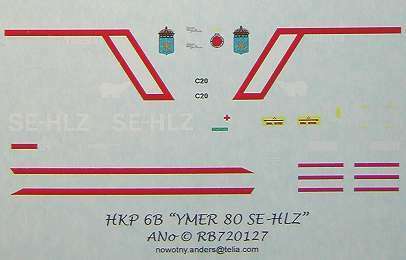 New decal sheets are the S-70B2 Seahawk in delivery scheme, an updated current RAN Seahawk, and UH-1D/H 'Bushrangers'. The Sea King sheets (HKN #158) are due back from the printers about now. There will also be sheets covering USMC Carrier Air Groups available mid-year. 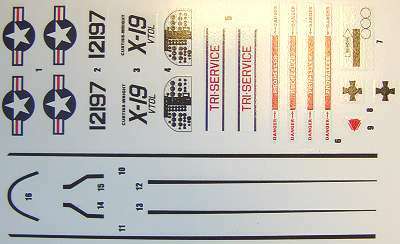 Series 1 - Profiles, including voucher for a special decal sheet featuring some of the aircraft as shown in the artwork. The first books will include Sea Kings, Bell UH-1D/H's, Wessex etc. Series 2 - Walkarounds. "Colour, top quality photos, artwork, kitographies, scale and detail drawings. The subjects will run close to the Profile series." Series 3 - Photo Books. "High quality books of unpublished photos of modern aircraft and helicopters." Specials - Squadron Profiles. "History, photos, artwork, etc. of squadrons from around the world." Decal sheets will be produced for release alongside each of these books. Thanks to Alex Huang, Arnold Chiu (Anigrand), Gary Madgwick (Model Alliance), Petr Zaoral, Anders Nowotny and Philippe Dognon (Landing Zone).